With 70% of playground injuries resulting from falls off equipment onto unforgiving surfaces, how you handle surfacing is very important to your children's safety and your risk management effort. The surface under and around your playground equipment can go a long way toward preventing the injury potential from a fall. Hard surfacing materials, such as concrete or asphalt are unsuitable for under and around play equipment. Grass or packed earth are also not recommended because they have poor shock absorbing properties and injury may occur from a maximum fall height. 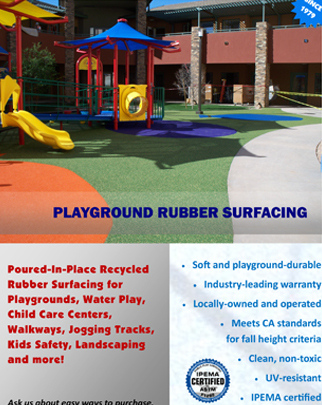 The most common playground surfacing solution because of the reduced initial costs. 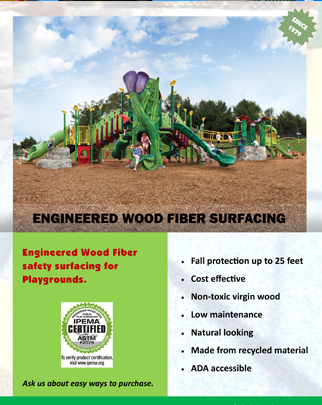 Wood fiber meets the safety and accessibility requirements. Similar to tiles in its shock-absorbing properties and being maintenance-free. 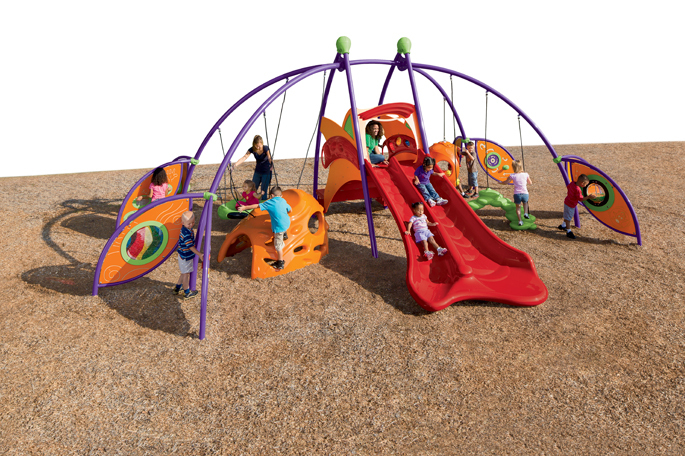 Poured-in-place rubber surfacing is trowled around your play equipment providing a seamless surface that meets all CPSC and ASTM guidelines for safety, durability and accessibility. Shock-absorbing resilient tiles provide a permanent, maintenance-free answer to playground safety and accessibility needs in compliance with the guidelines established by the CPSC and ASTM. Playground surfacing helps cushion the fall. Poured-in-Place rubber surfacing provides a seamless surface.